The On-Stage WSR7500 Workstation Rack Cabinet 12-space rack stand provides easy access to all your rack equipment. 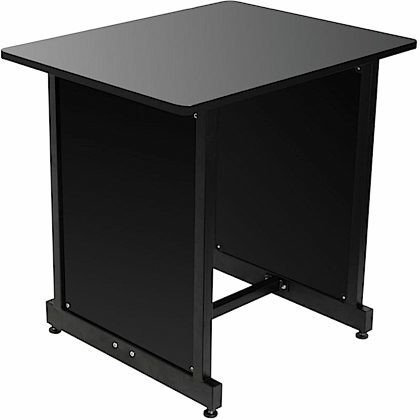 It can stand alone, or be attached to the WS7500 or WSC7500 for additional tabletop workspace. Available in two finished colors. - Dimensions: 30(w) x 23.8(d) x 25(h)"
- Includes 4 removable casters; 2 locking. Overall: Alright, to be perfectly upfront - there is better stuff out there. However, for a hundred bucks, you can't do much better. But there are a few things you need to be aware of with this unit.First off, as a previous reviewer alluded to, it's very easy to misalign this unit. The problem is that it's still very flexible as the top is being screwed in and once you screw in the top, you can have a seriously misaligned unit. So here's the most important tip I can offer to resolve this issue: you have to take a piece of rack gear, or at least a blank, and screw it into one of the middle positions on the rack before screwing the top down. If you place it in a top rack position, you won't be able to fit your screwdriver in. If you put it in a bottom position, it won't give you the rigidity you need to keep everything square. But with a piece of gear bolted in, the rack will stay rigid and you can be confident in having a working unit.Upon close and deep inspection, such as while putting this unit together, you will no doubt realize how cheap it is. However, you will also realize that it's pretty cleverly designed and goes together surprisingly easily. It looks pretty nice. The size is reasonable, although the desktop space really isn't sufficient to get proper spacing a pair of monitors. Nevertheless, for around a hundred bucks, there's not much out there that seems much better. I'm happy with it, and it works. Just make sure you are keeping the rack ears aligned with a piece of gear as you're screwing in the top. If you simply rely on the pre-drilled holes, it's not going to go together right. I rated the sound as a 5 on this. I like the sound it makes when I bang my head against it. WTH. Why can't I leave some scores blank? Rank units don't make sound, duh!